On July 4, 1919, American supporters of Irish independence crashed the Independence Day parade in Washington D.C. Their participation had been officially banned by the parade organizers because Ireland was not a “fully accredited” nation, but—undeterred—they decorated a car and simply drove it from a side-street into the parade of floats. The morning of the parade, a beautifully decorated automobile bearing placards which said: “All free nations are in the pageant—official statement. I am refused a place” and “There will be no peace in the world until Ireland is free” appeared on the streets. It was driven by Jack La Follette, with Miss Rosser attired as Erin as a passenger. Ten minutes before the parade, the nervy Jack had maneuvered his car to the head of the parade where it remained for a block when it was forced out by order of Louis Brownlow, the police commissioner. La Follette drove his car around the block, again entered the parade and continued to the end while 100,000 cheered. The police forced him out of line several times but he returned and, just to make the demonstration more perfect, he and Miss Rosser passed twice in review before the east front of the Capitol. Born in Fairfax, Virginia, Rosser was a tireless activist for Irish independence, traveling across the country to lead protests and demonstrations. She once helped organize a longshoremen’s strike in Boston, stopping ships bound for Great Britain—and she was expelled from the U.S. Capitol in 1920 when she and several other women shouted from the galleries for the US to cease its support of British colonial rule. Sources here, here, and here. The picture above is dated 1920 by the Library of Congress; I think there’s a chance this is actually from the 1919 Independence Day Parade, but Rosser may simply have employed the “Ireland in Chains” costume on several occasions. 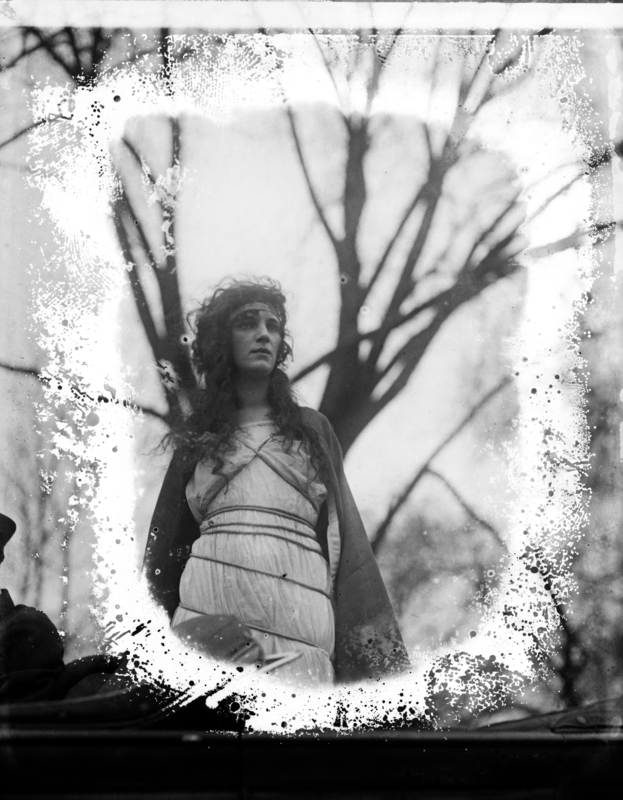 This entry was posted in Uncategorized and tagged 1910's, 20th Century, Activism, Amelia Rosser, Cars, Ireland, Jack La Follette, Parades, Photography, USA, Women. Bookmark the permalink.